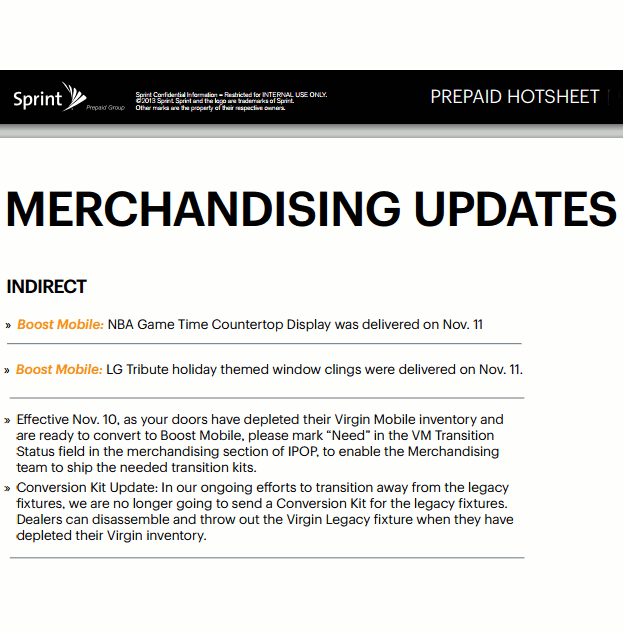 Home - Boost Mobile , News , Virgin Mobile - Virgin Mobile To End Sales Through Independent Dealers? Virgin Mobile To End Sales Through Independent Dealers? 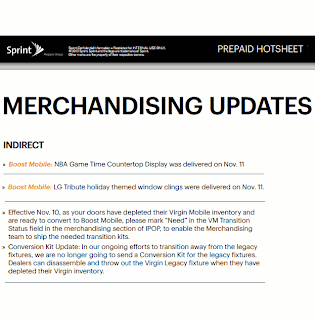 Effective Nov. 10, as your doors have depleted their Virgin Mobile inventory and are ready to convert to Boost Mobile, please mark “Need” in the VM Transition Status field in the merchandising section of IPOP, to enable the Merchandising team to ship the needed transition kits. Conversion Kit Update: In our ongoing efforts to transition away from the legacy fixtures, we are no longer going to send a Conversion Kit for the legacy fixtures. Dealers can disassemble and throw out the Virgin Legacy fixture when they have depleted their Virgin inventory. If I'm interpreting this correctly, it means that once they have sold their current Virgin Mobile device inventory. independent dealers will no longer be able to offer Virgin Mobile products. There's an active thread on HowardForums where people are debating what this change means for the future of Virgin Mobile. Although there's speculation that the Virgin brand is being phased out entirely, I believe this is just a shift in marketing strategy. I expect that Virgin Mobile will continue to be sold by national chains like Target and Walmart and on the Virgin Mobile website. I can't imagine this change will be good for dealers. The combination of Boost and Virgin gave them a wide range of plans to sell. Virgin has plans starting at $20/month. Boost's least expensive plan is $35/month. Removing Virgin Mobile from a dealer's lineup means fewer choices to offer to price conscious cash customers. This will hurt dealers, especially when mass market competitors like Walmart and Best Buy can still offer cheaper plans from Virgin Mobile and TracFone. I saw this coming, boost has had promotions back and forth and has released a numerous number of new phones while nothing from virgin. The weekly ad from RadioShack this week only mentions boost and sprint prepaid plans, maybe nothing major but just my observation. With Virgin apparently dying. it might be a good idea to buy old used, or bottom of the line new handsets if at all. Seems like it would make little sense now to buy a flagship type device from Virgin, because once Virgin completely dies, the resale value will be zilch, as it will be useless on anything else. Who knows what they are doing? It's Sprint, even with Softbank running things, they seem to be in perenniel headless chicken mode. Without a big gun plan like their old $25 unlimited text/data 300 minute plan, no true paygo, and taking it away from independent dealers, they're basically castrated as a prepaid product. A castrated Virgin. Ironic. Someone posted on one HoFo thread that it seemed Best Buy was for the most part replacing VM merchandising with Sprint Pre-Paid? My mistake, that would be BB replacing Boost not VM, so......? Sprint keeps shooting themselves in the foot. They need to bring Dan Hesse back before they are bankrupt. A friend of mine who is a Boost Mobile dealer tells me he was told Virgin Mobile will be completely phased out of Boost Stores by Jan 1, 2015. He thought that maybe Virgin Mobile PayLo phones will still be offered by Boost dealers. Some people are just not paying attention. Forget Sprint wholesale for a minute. Claure is giving new customers 13+ months of service on a month-to-month plan for two or more lines: $20 shares 1GB. $25 shares 2GB. $40 shares 4GB. Etc. No tricks, just the taxes on $20 or $x per month, and a $36 activation fee per line. That is it. You can roam on Verizon and regional carriers. BYOSD, or they will sell you a new phone for $15 or $25/month (depends on data pack) and little or no down payment (yes, you need credit). Dan Hesse never gave you anything close to that good. Framily failed. However, Sprint met its goal of 260M pops LTE several months early, network rip and replace is virtually done, and they dramatically increased the % of data coverage by LTE in every market as of the end of September. See the latest Fierce Wireless report by Root Metrics for all the details. Don't let prejudice get in the way of facts, people! Do your homework and recheck your local coverage, especially on the Postpaid network. Update: Sprint changed their family promo this evening. Only the $100, 20GB Share Pack for up to 10 lines still has the smartphone connection fees waived through 12/31/15. Maybe Virgin Mobile "Beyond Talk" customers will be phased into Sprint Prepaid.